My first impression of Lisa is that she's knowledgable and competent. She's friendly but has a no-nonsense approach to taking care of animals. She taught me a method to teach my 12 year old terrier how to get along with cats. No easy task, but it worked. 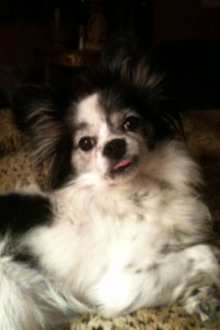 Lisa Warden and Twin Pines Pets is a God-send! I have known Lisa for 3 years through her work at the Humane Society Silicon Valley, where I volunteer. Naturally I was excited to hear that she was offering pet services in my area, Palo Alto. I have a special needs dog, Charley, and recently due to foot surgery I was not able to walk him regularly. 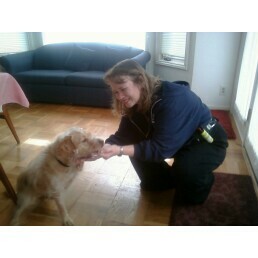 Lisa has been coming like clockwork 2-4 times per week for training walks, and Charley loves her. I have noticed significant improvement in his behavior when I do walk him, as her support has augmented and reinforced the work Charley did with his regular trainer. Not only does Lisa know what she’s doing with dogs and cats, she is very dependable, reliable, and trustworthy about accessing the dog while we’re not home, and an excellent communicator. She always leaves us a note about how things went, and we have never had a misunderstanding about an appointment or a service. I would recommend Lisa and Twin Pines to anyone in the area who needs a reliable and well-trained pet services professional at a reasonable price. Lisa has taken care of my 3 elderly cats for years. I did a great deal of research before deciding on Lisa as our pet sitter. She met with us at our house for a free consultation and got to know my cats before we hired her. My boys are the world to me and she is the only one who I would trust to care for them. One of the cats requires special feeding requirements (hand fed) and sometimes has accidents and another is a very shy cat who doesn't usually come out when strangers are in the house but they all LOVE Lisa. Lisa is always flexible to come to care for them even on the holidays! I get daily messages on their activities and a report card at the end of the visit. It is reassuring that Lisa has the qualifications & experience to address all their needs. She has even given us advice about diets and treatments to help my kitties with their special needs. If you need, pet sitting services, I would highly recommend Lisa. She cares for our cats as if they are her own. Lisa is the BEST! Lisa took excellent care of our cat while we were out of town. My wife and I also rested easier knowing our house was in her capable, conscientious hands. Animals are both her passion and her expertise. So she recognizes risks to their health and safety that I would never have thought of, knows techniques for handling and coaxing them, and cares enough to go to the trouble to do things right. No more begging friends to do us favors when we go out of town. From now on, we'll just call Twin Pines. I just got home, and Pico looks great! And, I love the little report cards and all the time that you took to write them out and all the emails that you sent to let me know how everything was doing. I think you're just the greatest. I would definitely refer you; I think you're wonderful. Thank you so much. Next time I go out of town, I'm going to give you a call. And that goes for my parent's cat too. Lisa was the best! I went away for 12 days and needed someone to take care of my cat, water plants/take in mail and turn lights on and off. Lisa did it all! She fed my cat, played with him, and even changed the litter box. She sent regular updates via email, and even left a "report card" for me. I was overjoyed that Oliver got the attention he needed; especially from a cat expert! I'll use Lisa again soon, and heartily recommend her with no hesitation whatsoever. See Yelp for more testimonials!